Half Speed Mastered LP Record of featuring the London Symphony Orchestra conducted by Andre Previn. 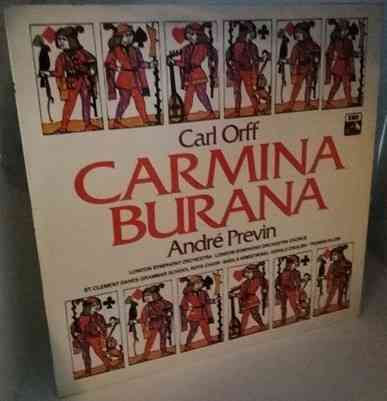 Original Master Recording issued by the Mobile Fidelity Sound Lab in 1975. Japan pressing. Sleeve printed in the USA. Includes inserts. 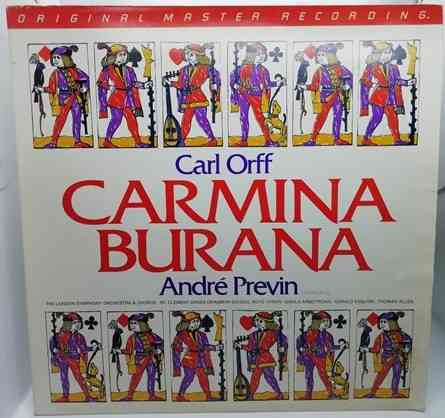 Half Speed Mastered LP Record of MFSL 1-506 Carl Orff CARMINA BURANA featuring the London Symphony Orchestra conducted by Andre Previn. Original Master Recording issued by the Mobile Fidelity Sound Lab in 1975. Japan pressing. Sleeve printed in the USA. Includes inserts. The record itself is graded a bit less than excellent, with a couple of light surface marks visible when viewed under normal house lighting. Play-tested on a USB turntable. Superb sound quality, with NO jumps, repetitive ticks or crackle and just a very very occasional light pop. Hardly worth mentioning. More or less faultless playback. The outer sleeve is graded very good, with some rubbing to the top two corner edges, a fingernail open tear to the bottom open corner and light general handling and storage wear. The spine is intact and strong with no loss to the lettering. The inner sleeve has no wear to speak of. There is a folding crease in the libretto insert and no wear to speak of in the MFSL card insert.